Blah. I should just try it already. Good luck to you for making it work! Amanda – Write down the few things you know how to cook! We usually have a “breakfast for dinner” night too, like pancakes or french toast, or an egg-sausage-english-muffin sandwich. Easy! I don’t like to cook either, so just being able to look at the calendar and be like, “Oh, today is baked potatoes” makes things so much easier. I know I can just poke them with a fork and pop them in the microwave for five minutes. No thought involved. I can’t guarantee this planning method will work for you, but for me it takes all the thought out of it and that’s what was holding me back. The benefit of cooking for one – it means that I can have a ham, spinach and cheese toasted sandwich with a piece and fruit for dinner. Yay, dinner in under five minutes! We have the exact same problem at my house. I’d love to plan out meals ahead of time and have thought about this before, but my husband NEVER wants to eat what I do. It’s ridiculous. I go grocery shopping weekly and buy all the things I think we’ll need for meals that week, but we always end up eating something else because my husband never wants what we agreed on and I refuse to take that much time to cook only for me. He’s worse than my toddler in terms how picky he is with food! Yay meal planning!!! I remember when I discovered this too and it was definitely revolutionary, if not a “this is so simple, why didn’t I do this before? !” haha. I’ve been experimenting with some other meal planning things that I might blog about eventually, because I’m always trying to find the most efficient ways to get a good dinner on the table instead of scrambling as well. Thanks for the link to those printables btw, the calendars are nice! I kind of do this before I go shopping for the week. I love to cook so I always have way to many ideas! 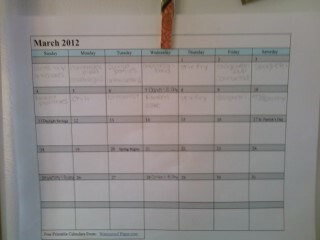 This is way more organized then my random notes on the back on scrap paper. Usually our dinners make for good lunch leftovers as we both bring out lunches to work and some of them have to be durable enough to put in a backpack for a day in the woods.